Leif Høegh was characterized by entrepreneurial determination and a tremendous working capacity, coupled with an ability to delegate authority. At the age of 31 he started his own company and emerged as an entrepreneur in maritime transportation. Throughout his life, Leif Høegh’s main interest was primarily aimed at macro-economics and politics, as well as international trade and finance, which were interpreted into his own company strategy. His personal interest in literature and theatre also led him into the board of the National Theatre in Oslo, a position he served for many years. Mr Høegh grew up in Christiania (what today is Oslo) in an upper middle class family where his father ran a successful timber trade business. It is probably here, at the dinner table conversations, that Leif Høegh’s interest in trade and economics started. As the Great War spread through Europe, Mr Høegh enrolled as a student in political economy at the University of Christiania and passed his degree with honours in May 1916. After a year of military service, it was then time to decide what to do next. Already at this time, Leif Høegh considered shipping to be the only true international business conducted from Norway, and he was intrigued to learn more of its dynamics. This brought him to work in New York for a few years before returning to Norway to use his newly acquired knowledge. Leif Høegh considered shipping to be the only true international business conducted from Norway, and he was intrigued to learn more of its dynamics. After a few years working in shipping in Oslo, Leif Høegh started to consider investing in tanker shipping himself. In 1927 he travelled to London to discuss the matter with brokers and key persons in the oil industry. On his way back to Oslo he met with A.P Møller in Copenhagen, who advised him “Start on your own as soon as possible; this is what I did at your age, and I have never regretted it”. A couple of days later, Leif Høegh signed a preliminary contract for an oil tanker with Odense Staalskibsverft, with financial support from A.P Møller. In August 1928 Leif Høegh's first vessel; ‘Varg’, left the Danish shipyard bound for Baytown, Texas, USA. In August 1928 Leif Høegh's first vessel; ‘Varg’, left the Danish shipyard bound for Baytown, Texas, USA. 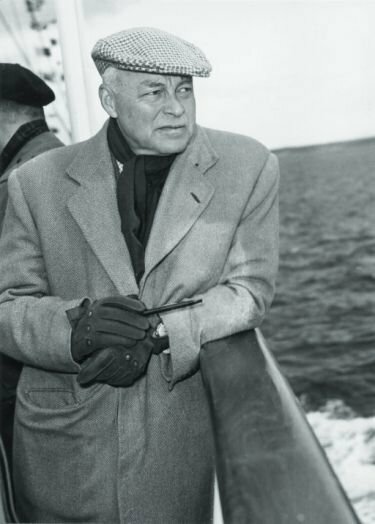 In addition to leading his company into a prominent position, Leif Høegh also took an active part in international shipping politics during and after World War II. As Norway entered the war in 1940, the Norwegian Government acquired the whole Norwegian fleet of merchant ships and organised it under Notraship, led from London. Meanwhile, Leif Høegh and his friends in the Norwegian Shipowners’ Association, met for underground meetings in Oslo, resisting the occupants. In his memoirs, Leif Høegh writes that during some of this time he hid from a potential German arrest by spending "the nights in the main building with a knitted woolen cap and mittens in minus degrees or with the "woods-people". “I always had skis standing outside the dinner room window", he writes. Always ready to flee in to the forest should the Germans acquire to speak with him in his home. In 1944 Leif Høegh was asked by the Norwegian Government, then sitting in London, to come to London and run the United Maritime Authority (UMA), which would be the international shipping organisation after the war, while Notraship was being dissolved. Leif Høegh stayed in London until one year after the war ended but continued to take part in shipping community meetings across the world for many years after this. In 1944 Leif Høegh was asked by the Norwegian Government, then sitting in London, to come to London and run the United Maritime Authority (UMA). Back in Norway in 1946, it was challenging to start up the shipping company again, Leif Høegh writes in his memoirs. To begin with, he arranged his private home in to a preliminary office for the business. After a few years the company moved in to new offices in Parkveien 55 in Oslo where it had offices until 1982. Leif Høegh continued to take active interest in politics and macro-economics throughout his life. He lived to see the transformation of his company from an entrepreneurial enterprise into an organisation headed by a professional management team under the leadership of his sons. Upon his death in 1974, Leif Höegh & Co ranked as one of the largest privately owned shipping companies in Europe. Leif Høegh lived to see the transformation of his company from an entrepreneurial enterprise into an organisation headed by a professional management team under the leadership of his sons. * Source: "I Skipsfartens Tjeneste" by Leif Høegh and "Höegh: Shipping through cycles" by Dag Bakka Jr.